If you are hiring sales staff then this post will explain in detail how to use a personality test for hiring sales staff. I will take you through my own step by step process and give you a formula you can use again and again. Hiring sales staff is one of the most crucial and most difficult recruitment jobs you face. Hire the right sales person and your business can flourish. Hiring the wrong sales person and your business may never recover. A friend of mine had a small but successful business and decided to hire a new sales person to let him spend less time selling and more time running the business. It took him three months to notice it wasn’t working. It took another three months to get rid of the person and it took another six months to repair the damage the person had done. The whole experience nearly put him out of business and wasted a year of his life. A personality test would have saved him a lot of trouble and reduced the risk. So how do you use a personality test for hiring sales staff? There are ten sales topics to choose from. I recommend you pick about four or five. When designing your personality test report, pick topics that are most relevant to your job role. It’s located in the General section. I’ll explain why in a minute. Your environment will suit one sales style more than another. You need to understand what kind of environment you actually have. Contrary to popular belief, sales people come in all shapes and sizes (in terms of personality type). There is no definitive “sales personality” that works for every situation. I had a client in London who ran a field sales team of 120 people. He had staff turnover issues and was trying to identify candidates who could stick out the job and deliver sales. We decided to first look at his staff turnover problem. Quite quickly it became apparent that the people he was hiring were being placed into a sales environment that was unsuitable for their personality type. In short, they would sell well the first couple of months, then sales would drop, then they would leave. High staff turnover was costing the company a fortune. Only the most senior staff were involved in training, so it was a huge waste of time and money if the new staff left after only three months. They had to stop the leak before doing anything else. The client was not prepared or able to change the sales environment, so we had to figure out the personality type that would be most compatible with the sales environment he offered. Create a new benchmark by completing the questionnaire. It asks you questions about the specific job role, so make sure you are intimate with the job role. At the end you will have to pick a report design. Select the one you designed as per Step 1 above. The Map gives you an indication of the personality type you are looking for. 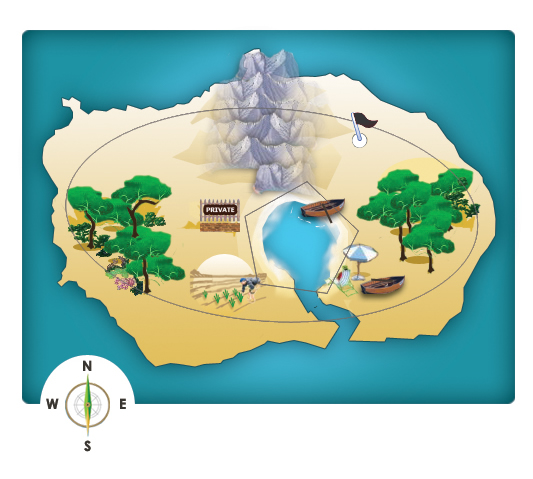 In this example the benchmark is in the North East of the Map. This tells us that candidates located in the North East are most likely to work out in your particular sales environment, based on the answers you gave in the Benchmark Questionnaire. They don’t need to be precisely in the same spot. Anywhere in the North East is close enough. 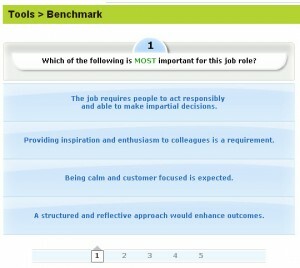 Important : The benchmark is specific to your job role in your company. A benchmark from another company may be misleading. Just because the job title is the same, it doesn’t mean the environment will be the same. The line manager plays a large part in the resulting environment. 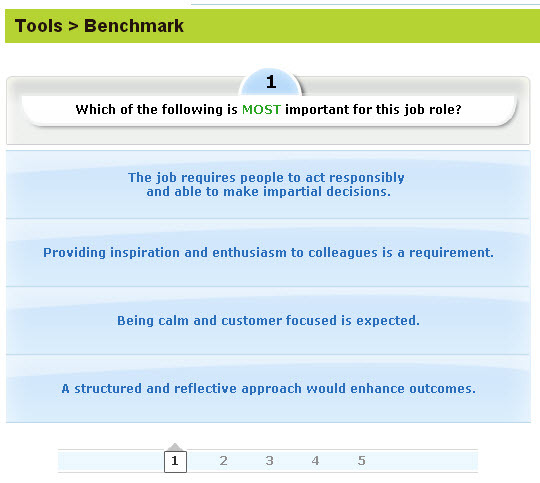 This is why we recommend the line manager complete the benchmark questionnaire. The personality test report really comes into its own in the interview. If you included the “Sales Style” topic then it will tell you exactly how the candidate approaches sales. From this you can judge if it is compatible with your sales environment. For instance some sales cycle are long and detailed. They require a lot of patience. Other sales cycles are short and the deal is done usually in one visit or phone call. These are two very different sales environments and the type of sales person will vary considerably. 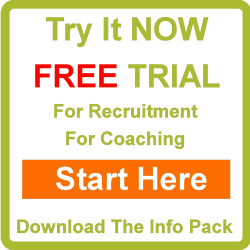 Use the Sales Style report to determine if the candidate will suit your particular sales environment. 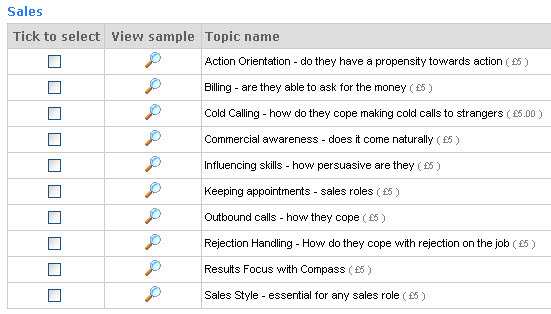 Other topics that will help you are “Cold Calling”. If your sales role has a lot of cold calling then you want to know how the candidate will cope. It’s not enough to just expect them to put up with it. Some people are more able to do a lot of cold calling than others. The topic will tell you how each candidate fairs with cold calling. Hiring sales staff is very risky and very difficult. Don’t presume because someone sold well in a previous job that they will sell well in yours. You may have a different sales environment. If you need more help identifying your sales environment then please let PeopleMaps help. Login to your Control Room and click on “Design a new report” and select option 3 and complete the “Done For You” request form. There you may tell us as much about the sales job as possible and we will make a recommendation.